Every year, we ask our customers of how their medical IDs have made a positive impact on their lives. Their stories help us raise awareness of why medical IDs are important and give us an inspiring look at how our customers are living their life to the fullest, despite the challenges of living with medical conditions. Let us share with you some of the best and bravest stories that we received. Amanda was a child when diagnosed with a connective tissue disorder and it has impacted her everyday life since. In February, Amanda was taken into the ER with symptoms of an aortic dissection. She was in a lot of pain but kept feeling stressed with her concern of telling emergency personnel about her medical condition. “What if something happens to me and I’m unconscious, how will anyone know about my genetics and the important health issues they cause?” says Amanda. Now, Amanda loves the security and peace of mind that her medical ID necklace provides. In fact, she is planning to get a new one of a different style. In February 2015, Jonathon felt seriously I’ll. He experienced being misdiagnosed only to collapse after being sent him. His symptoms were finally identified and linked to his ruptured spleen. The thought of being without a spleen seemed like a scary topic to talk about for Jonathon, especially of the high infection risks that he now lives with. Today, Janice takes comfort and pride that she can live her life knowing that her medical ID will allow paramedics to help her in an emergency. She also shares how kids adore her interchangeable bracelet and enjoys swapping different bands for different occasions and seasons. As a parent to a child with autism, Donna’s fear of his son bolting and being lost from their family home is always present. Their fears came to life when their son managed to run away, 4 blocks from their home. Thankfully, he was found by a good Samaritan who realized that the child is unable to speak. After this terrifying incident, Donna made the decision to put a kid’s medical ID on her son. We want thank all of our customers who shared and continue to send to us their inspiring stories. If you wish to read more, please visit our Life Stories page. Please follow us on social media, American Medical ID on Facebook and Instagram for more updates and upcoming competitions that we have in store for our community. *Winners of our My ID Story competition each won a medical ID valued up to $200 and have been notified via email. 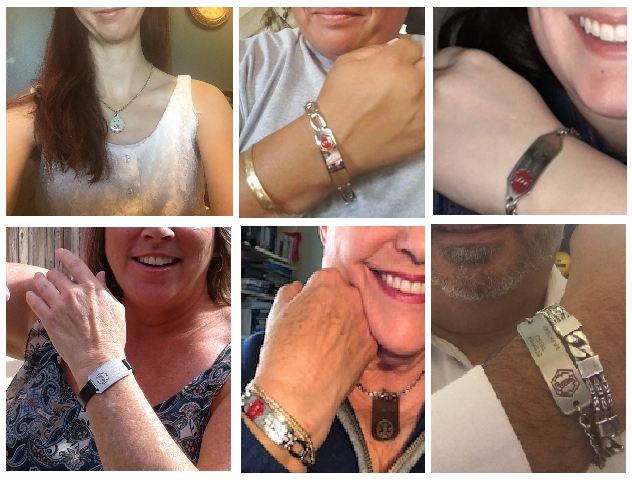 customer reviews, life stories, medical emergency, medical ID, medical ID bracelet, medical ID jewelry, my id story. Bookmark.